PROPERTY developer SP Setia Bhd is projecting RM2 billion sales this year, driven by the improved economy and ongoing product launches in addition to its financial package campaign offerings. The group has 10 ongoing projects and some 1,578 hectares. of landbank with a total gross development value of RM26 billion, sustainable over the next 12 years. Despite the challenging economy, it posted a RM171 million net profit and a record breaking sales of RM1.65 billion last year. "Sales have continued to hold up at higher than the pre-crisis level due to the group's strong branding and innovative marketing strategies," said president and chief executive officer Tan Sri Liew Kee Sin after the company's annual general meeting yesterday. He said continuous strong sales is projected in its key locations namely Klang Valley, Penang and Johor. The 5/95 financial incentives undertaken by SP Setia has helped to push sales tremendously. During the first quarter of 2010, it recorded RM608 million in sales, a sixfold increase from the RM101 million during the same period in 2009. Last year, the property group made its foray into the luxury high-rise development with the launch of Setia Sky Residences located in the vicinity of Kuala Lumpur City Centre, Setia Walk in Puchong and EcoLakes in Vietnam. SP Setia ventured into Vietnam in mid-2007 with a US$12 million (RM40.4 million) acquisition of a 243ha land located 42km north of Ho Chi Minh City. Last year, it also entered into a joint-venture agreement with Hangzhou Ju Shen Construction Engineering Ltd to carry out mixed development projects in XiaoShan, Hangzhou. "However, sales this year will mostly be from the Malaysian market as we are stronger economically. Sales from Vietnam is only projected to be about RM100 million of the RM2 billion total sales target," Liew said. SHAH ALAM: Property developer SP Setia Bhd has increased its sales target for the financial year ending Oct 31, 2010 (FY10) to RM2bil from RM1.65bil announced earlier, backed by a jump in sales of RM608mil recorded for the first quarter. The group achieved its highest ever sales of RM1.65bil in FY09 despite challenging market conditions last year. President and chief executive officer Tan Sri Liew Kee Sin said he was upbeat about the sales target after the group recorded a six-fold increase in sales for the first quarter compared with RM101mil achieved in the same quarter of FY09. 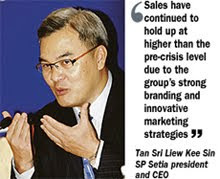 “The group’s sales have continued to hold up higher than pre-crisis levels due to strong branding and adoption of innovative marketing strategies,” he said after SP Setia’s AGM yesterday. He added that the sustained sales performance, despite a price increase of at least 10% for the group’s entire product range, would underpin its targeted return to growth this year. “Of the RM2bil sales target, almost all will come from the local market and 10% from our project in Vietnam. “The market in Vietnam is not so stable at the moment and we are taking it slow and steady there,” he said. Liew said the group’s main focus would be its projects in the Klang Valley, Penang and Johor Baru. “We have about 10 ongoing projects in Malaysia with a total gross development value of RM26bil that would last for 10 to 12 years on our 3,900 acres of land,” he said. AKS Resources Bhd will help Star Publications (Malaysia) Bhd turn its land in Petaling Jaya, Selangor, into a residential and commercial development. The project will boast a gross development value of RM370 million, JAKS said in a filing to Bursa Malaysia yesterday. MYDIN Mohamed Holdings Bhd, the operator of the locally-owned Mydin wholesale stores and hypermarkets, plans to build its biggest hypermarket in the country at the Tunjong new township in Kota Baru soon. The RM200 million hypermarket, expected to be completed by 2012 will be built on a 7.2 hectare site about five kilometres from the town centre. Mydin managing director Datuk Ameer Ali Mydin said the Kelantan government was in the final phase of acquiring the land for the project from its owners and the ground works were expected to start in May. "It will be our biggest hypermarket in Malaysia to date and will have 2,000 parking bays. We have decided to build a big hypermarket in Kelantan because we have a large piece of land for the project and also because we believe there is a demand for it," he told reporters in Kota Baru on Tuesday night. Ameer Ali was speaking after a special prayer led by Kelantan Menteri Besar Datuk Nik Aziz Nik Mat for its latest hypermarket in Kubang Kerian. Mydin also targets to set up hypermarkets in Johor Baru, Ipoh, Kuantan and Kuala Terengganu by as early as next year, he said. On its business, Ameer Ali said the economic recession has proven to be a blessing in disguise for the company, as revenue swelled to RM1.3 billion last year from RM1.1 billion in 2008. "The recession has led to more consumers frequenting our outlets as we offer competitive prices for our goods," he said.